Hello lovelies and happy Sunday! I'm excited today because I'm starting a new nail art challenge. You all know that I'm not a girly girl and that I rarely wear pink. 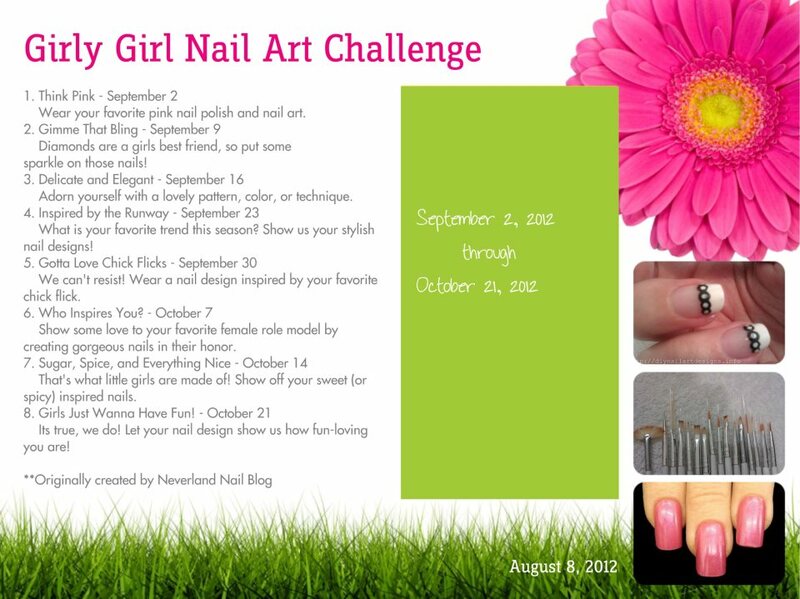 So this is a real challenge for me but I like to be challenged, so I'll do my best to deliver some girly manicures. 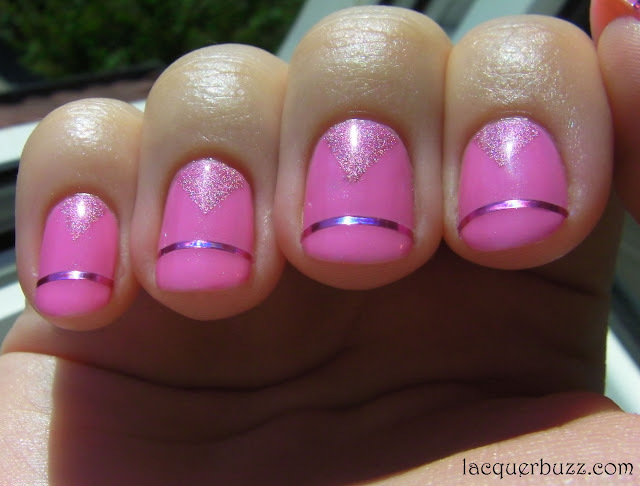 We will be posting the manicures weekly for about 2 months. Here's the schedule and the themes for the Girly Girl Nail Art Challenge. As you can see in the picture, the theme for today was Think Pink. Now first of all, I don't really have many pinks in my collection. So it was very hard to pick a favorite pink. Finally I decided to use a polish that is very dear to me and that's because it's the first I ever posted about on this blog. My pictures were awful back then and I cringe every time I look at them, but I'm not ashamed. It shows how much I've grown and how much my manicure and my photo skills have evolved. So you can check my original post about S-he Stylezone 155 here. I really did my best to incorporate this in a nail art and here's what I came up with. The base color is Kallos 54, the only bubblegum pink I own. I actually discovered that this has some tiny silver shimmer in it, which is kinda ironical because I've had this polish since forever. I guess it shows how much I've worn it. After I applied 2 coats of this, I applied some Seche Vite to make it dry faster. I waited for about 30 minutes before sticking some tape in the form of a triangle at the base. I painted the S-he into the triangle and removed the tape before it dried. 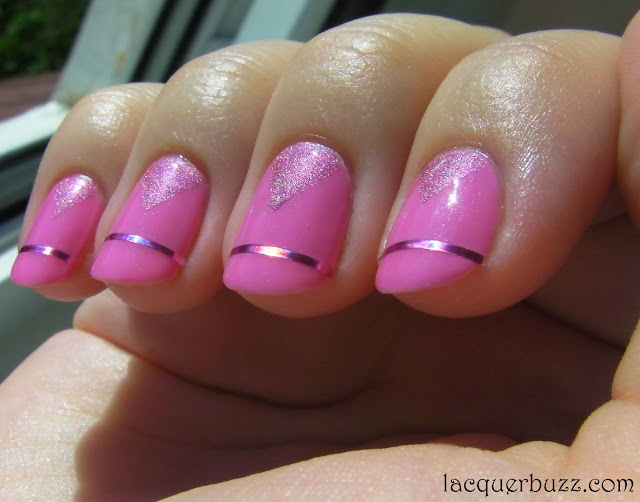 I finally finished with some pink striping tape and another coat of Seche Vite. S-he 155 was also my first ever holo polish. The holo effect is very very subtle but you can still see it in the sun photos. I also like the shine of the striping tape in the sun. I'm really happy with how this manicure turned out, even though I had a lot of trouble with figuring out what to do. I guess thinking pink is very hard for me. 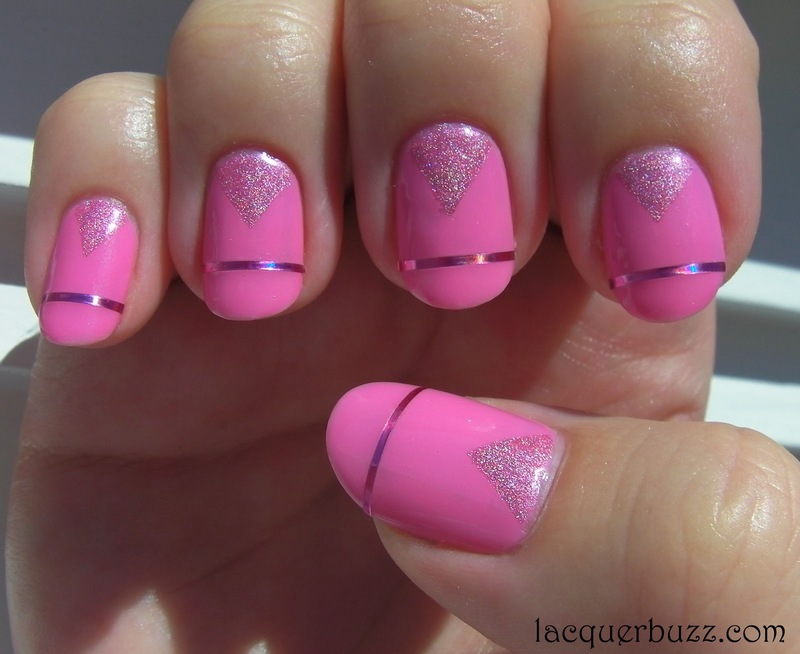 Awesome mani, Mihaela!! I love that you took on a challenge that you're not too comfortable with!! I have been doing it with stamping and somehow I'm getting better!!! 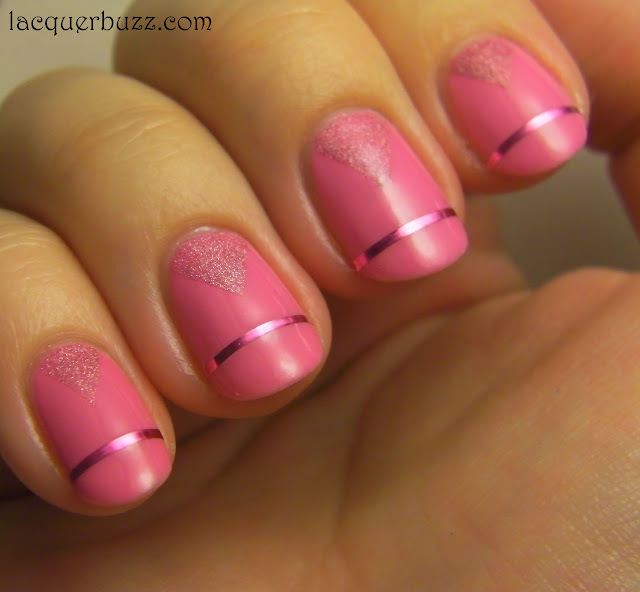 Love the striping tape for the sparkly accent! Just gorgeous! What a neat concept with the tape and the triangles! Love!! Great concept! I love how it turned out! Thank you! I think the new background looks much cleaner but still has a little something interesting to it. Thank you Gosia! I really tried my best with this pink thing and took my time with thinking it out. I'm glad it came out so well. I read a quote somewhere that said "the first way of getting better at something is sucking at it first" or something like that. I think that's so true! I was very bad at stamping at first and the only way to get better is to challenge yourself and do it! Thank you! I wanted something original because I don't have many pinks in my collection and I had to work with the boring ones I had. Thank you! And thank you for hosting the challenge! This came out great, love it!